It’s called a potato and it looks like a potato, but you’re not going to find any “real” potato here. Just a potato look-a-like. See’s Candies’ St. Patrick’s Day Potato is a special treat that the candy company puts out every March. The 2.5-oz. potato has a large, irregular mound of nougat at it center. The nougat is soft and not too sweet, despite being made primarily of sugar, and is packed with chopped English walnuts that give it a lot of texture. The center is enrobed in a very thin layer of milk chocolate, not too add flavor, but simply to seal and protect the nougat and give the topping of cocoa powder and cinnamon something to adhere too. Pine nuts inserted randomly into the top stand in as the potato’s eyes. It’s too bad that they only see these once a year because they’re really tasty – especially if you’re a nougat fan. Of course, it would be slightly odd to eat potato-shaped candies at other times of the year, but any social stigma that results is something to deal with when it actually comes up. I’m glad you reviewed this item–I’ve seen it advertised but never bought one. I love See’s Awesome Nut and Chew Bars, and wonder if the nougat in the potato is similar to that bar. 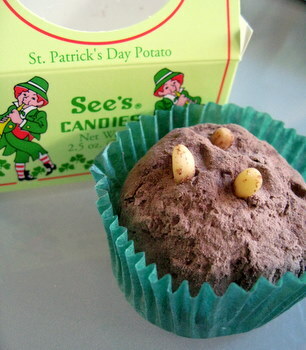 This sounds much yummier than the Philadelphia St. Pat’s tradition of “Irish Potato” candies. I made them at work, and they are just butter, cream cheese, coconut and sugar rolled in cinnamon. 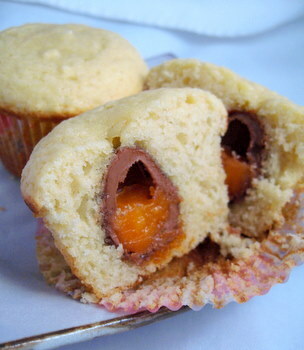 It’s just a sugar bomb! I am so sad that we moved to Texas and they don’t have See’s Stores here. My younger daughter, from the age of 2, would say that the chocolate store is her favorite place in the mall.